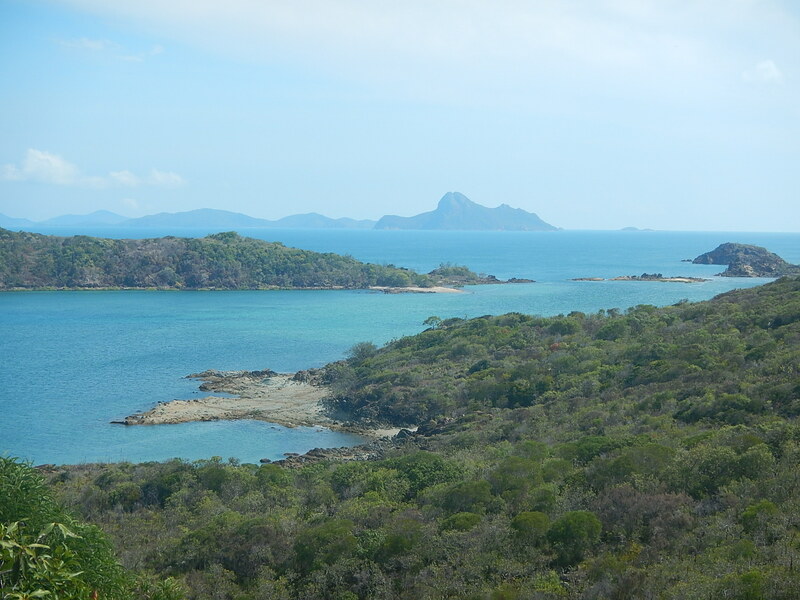 After touring the desert heart of Central Australia, I flew to Brisbane for a night and then caught another flight the next day to Prosperine for a few days in Airlie Beach and the Whitsunday Islands, a beautiful spot along Australia’s Queensland Coast. The contrast between the dry red landscape that I had been traveling through during the last week could not have been more stark. After landing in Proserpine, I was struck by how green, lush and tropical the area was. Airlie Beach is built on the hillsides overlooking the the ocean. 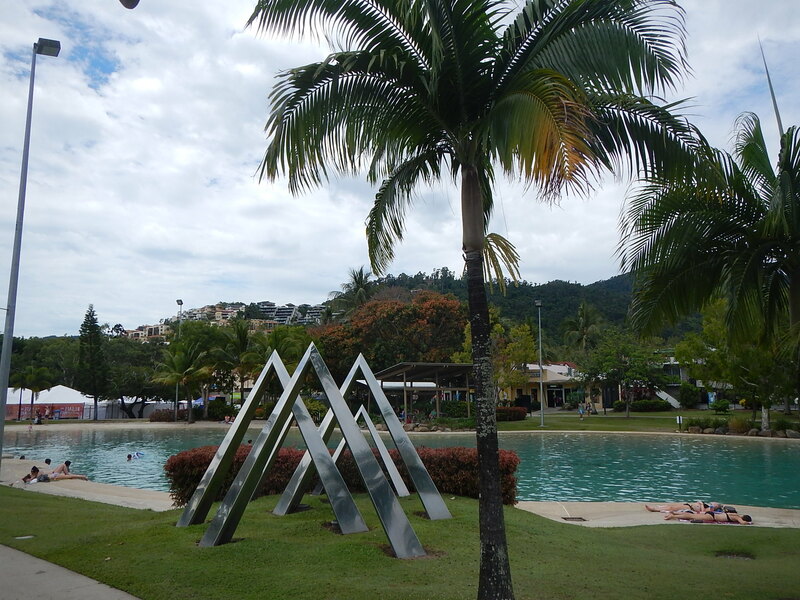 The verdant, mountainous landscape actually reminded me of Florianopolis, Brazil. Unfortunately, the first day did not portend good weather for my few days’ visit. Like the tropics, bands of rain drenched the afternoon. To top that, I found out it was Schoolies Week in the Airlie Beach (Americans, think Spring Break on the Gulf Coast or Daytona Beach), so I was having to share my paradise soaked with a bunch of drunk Aussie teenagers. For my first night, I stayed in my hostel, the well-run Backpackers By The Bay, chatting with fellow travellers and lamenting my timing. 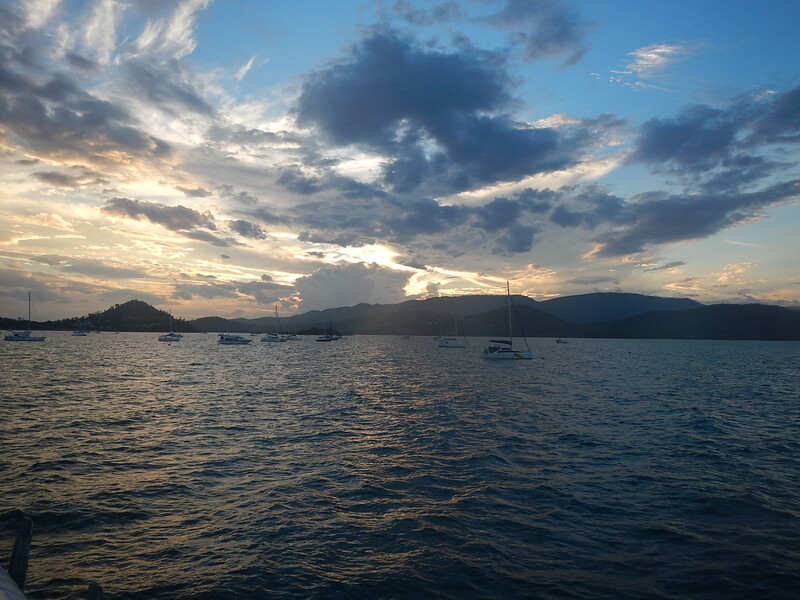 However, my few days in the Whitsundays didn’t turn out so bad after all. In fact, they were amazing. 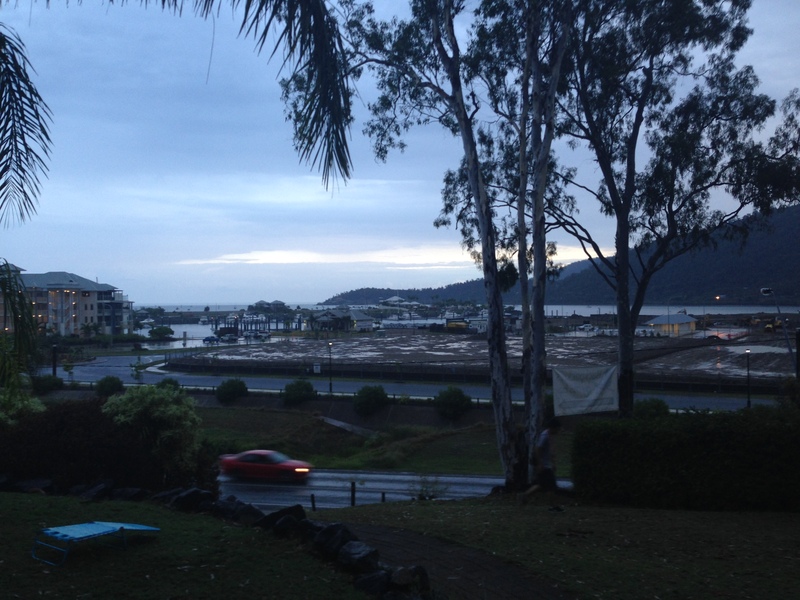 After getting up the next day, I decided to explore the waterfront of Airlie Beach. A pathway leads along the waterfront to the Abel Point Marina. Swimming from the beach is discouraged during stinger season, but I was able to swim in the Lagoon, a very pleasant man-made body of water close to the beach. The water was blissfully warm and relaxing. 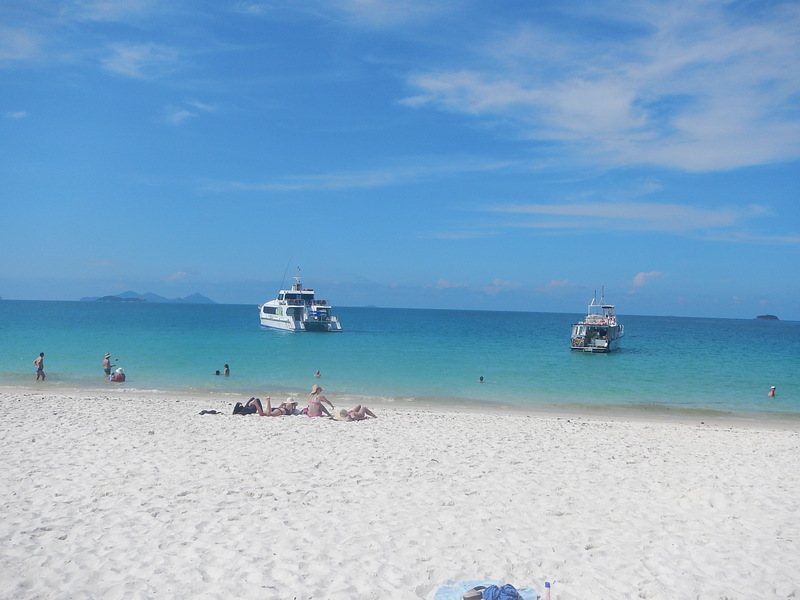 Unsure about weather, I decided to go ahead and book a boat trip to Whitehaven Beach even though my trip the following day would include a Whitehaven trip as well. I wanted to have the chance to see the iconic beach in clear weather, so I booked a half day cruise out to Whitehaven Beach with Cruise Whitsundays for $99 AUD. While I had been warned that I might not be able to book a boat ride because of all the Schoolies, I didn’t have any problems booking this one and I don’t think there were even any Schoolies on my boat ride. 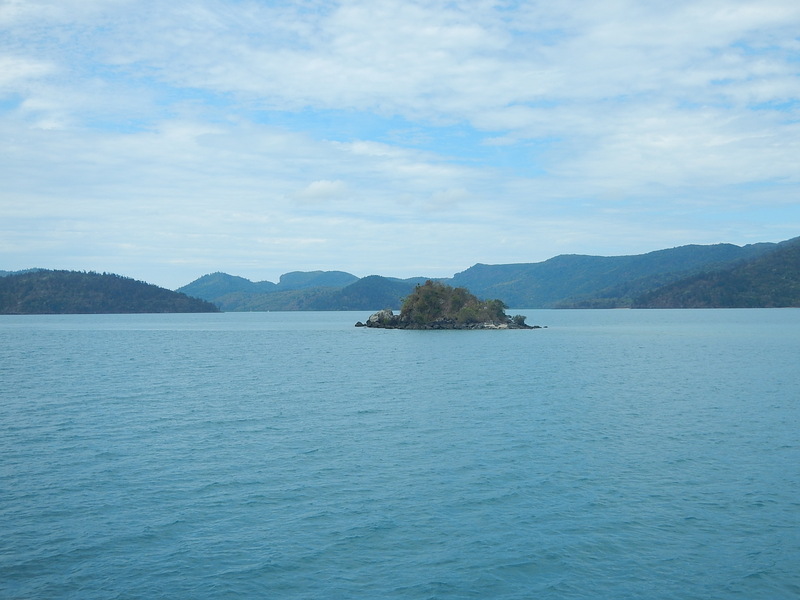 I really enjoyed the trip with Cruise Whitsundays. The boat left from the Abel Point Marina and then we had to change boats in Daydream Island, a somewhat tacky yet beautiful Hawaiian themed resort on one of the islands. We proceeded on out to posh Hamilton Island and picked up some more passengers. Along the way, I admired the green islands scattered throughout the crystal blue ocean. The weather certainly held out for the day. We rounded the edge of Whitsunday Island and made our way to stunning Whitehaven Beach, only accessible by boat or seaplane. Interestingly, the beach wasn’t discovered by Europeans until 1879. Captain Cook completely missed it when he traveled through the islands in 1770. Fortunate for me and the other travelers on my boat, we were the only other boat to be at the beach on that gorgeous afternoon. There are no docks on the beach, so we had to walk off the boat on a gangway. The seven kilometers of white sand on Whitehaven Beach actually isn’t really sand at all, but 98% silica. Scientists theorize that the silica drifted from somewhere else, because the underlying rock does not contain quartz. Instead, it drifted north from the Queensland coast and became trapped here millions of years ago. The sand feels wonderful under your feet and makes squeaking noises when you walk on it. It is also a great exfoliant. However, if you visit, be careful not to set any cameras or electronics down in the sand as the silica can easily destroy these items. I got to spend two blissful hours on the beach, soaking up sun and silica on one of the most beautiful beaches in the world. I was thankful that the forecast had not been accurate. We were treated to a spectacular sunset on the way back to Abel Point Marina. On my second day in the Whitsundays, I scheduled a flight over the Great Barrier Reef with GSL Aviation and a snorkeling and beach trip with Big Fury on a combined ticket. 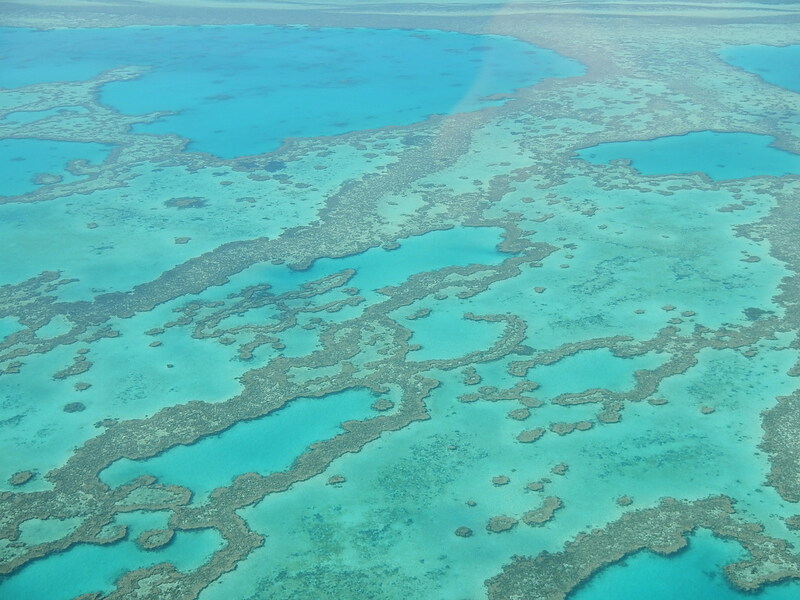 The scenic flight over the Great Barrier Reef was certainly money well spent. I did the Reef and Island flight which takes off from Whitsunday Airport and on out over exclusive Hayman Island, one of the most expensive resorts in Australia. Eventually on out over the ocean, we could see patches of reef and then miles and miles of strands of coral below. 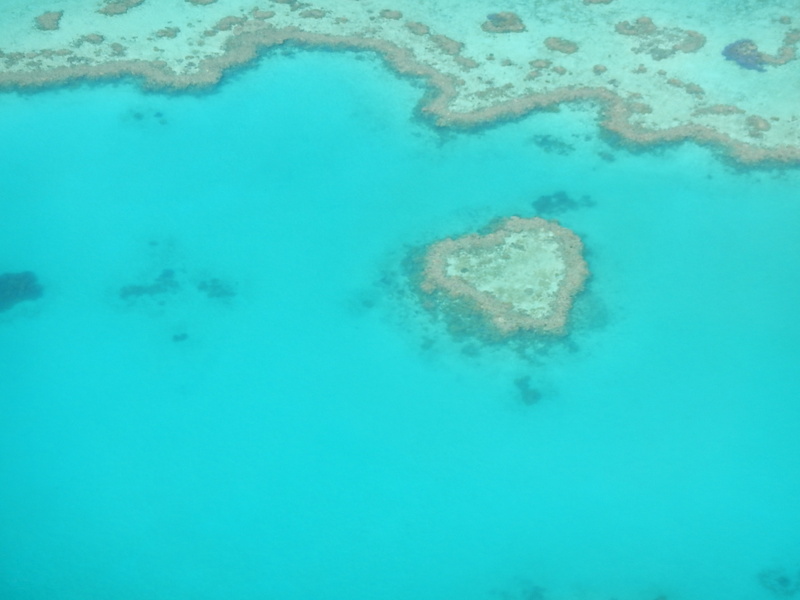 A special treat was seeing the iconic Heart Reef in the midst of it all. The plane proceeded over Whitehaven Beach, where I had been the day before. The beach looked spectacular from the air. After flying back over the islands, the plane landed at Whitsunday Airport. This wasn’t noticable during takeoff, but the airport is actually a tricky landing for pilots requiring a quick descent after crossing a mountain. You may not want to sit up front in the case this sort of thing makes you skittish. After the flight, GSL took me to the Abel Point Marina where I boarded for my snorkeling trip on the Big Fury. The crowd was a bit different from the Cruise Whitsundays trip the day before. It was full of Schoolies except for me, some French guys and a German girl. The Schoolies weren’t overly obnoxious though, so it wasn’t too bad. The Big Fury also differs in that it travels much faster than the Cruise Whitsundays boat, which makes picture taking a bit difficult. I didn’t mind this too much as I had plenty of photos of the islands from the day before. We stopped in a bay for one and half hours of snorkeling. I rented a stinger suit for $7, which with all the nasty jellyfish that can kill you, I figured this was a wise investment. The snorkeling was interesting. I got to see lots of brightly colored fish and some sea turtles. The coral wasn’t quite as brightly colored as I had pictured, but it was still amazing to see from the water. While my camera is waterproof, I didn’t want to bother trying to keep up with it so I didn’t take any pictures. I’m not sure how good they would have come out anyway. After getting back in the boat, the boat’s pilot spotted a baby shark in the water. I was very happy to be out of the water. 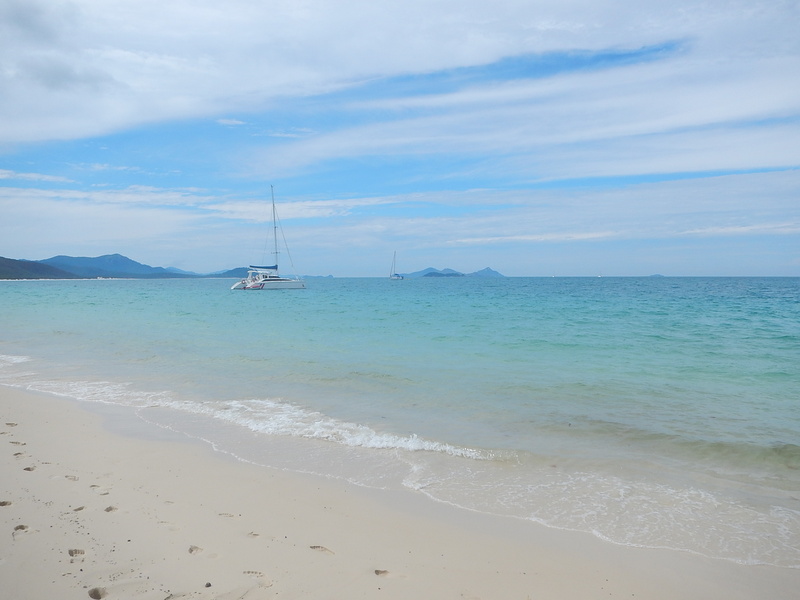 We proceeded on to Whitehaven Beach. I didn’t mind returning to this beautiful place at all. The Big Fury people provided a nice picnic lunch and I took a short bushwalk to an overlook. Along the trail there were lots of lizards who scurried away as I walked along. After returning to the beach, I enjoyed some more moments admiring the beauty of this place. Check the weather forecast, but realize that the weather in Airlie Beach can differ significantly from the weather conditions out at Whitehaven Beach. Check the calendar to avoid going during Schoolies Week. You might not have to mix with them if your accommodations and boat trips are posh enough, but on less expensive excursions, you might have a hard time finding a spot. Wear a stinger suit if it happens to be stinger season. Go on a slower boat like Cruise Whitsundays if you want to take lots of pictures from the water on the boat ride out to Whitehaven Beach. Keep cameras and electronics from having any contact with the silica rich sand of Whitehaven Beach. Do the hour flight with GSL Aviation over the Great Barrier Reef! Well worth the money! 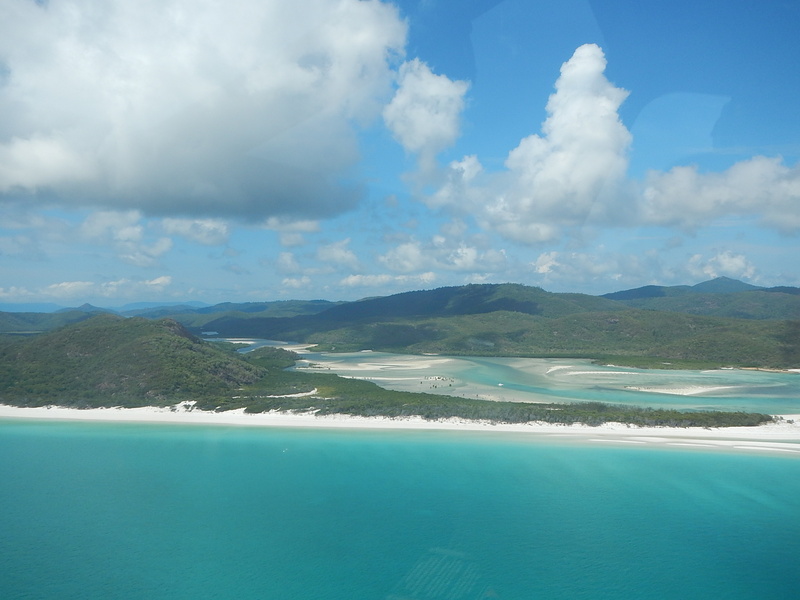 Do scenic flights over the reef and Whitehaven Beach at low tide.